For my birthday, I decided I wanted a tea party, complete with cute little cup cakes and triangular sandwiches. Originally I was going to buy the sandwiches, but I couldn’t bring myself to spend £20 on a plate of them when I could make them myself for half the price. So R and I made batches of cream cheese and smoked salmon, rare roast beef with horseradish mayo, Belgian ham salad with dijonnaise and cheddar cheese with red onion chutney. Delicious! 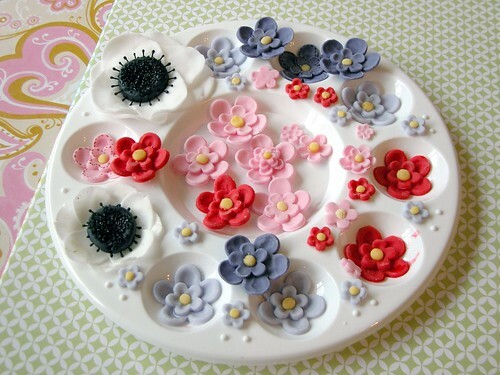 But of course, I had to do something with all my cake decorating goodies! So R and I dyed some fondant with the Wilton paste colours I bought at Hobbycraft, and rolled it out. 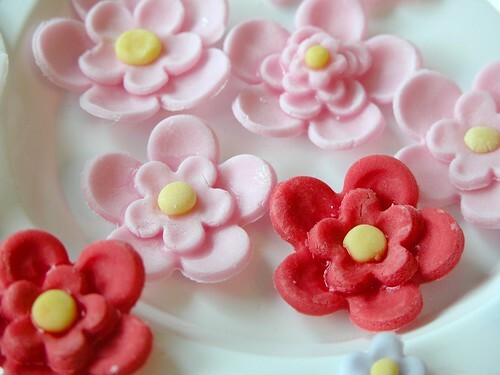 Then, we used the set of four blossom plunger cutters from PME to cut out these cute flowers. I also tried out making a patchwork effect on some of the flowers using a spice brown food colouring pen. What do you reckon? It worked well using that colour on the pink icing, because it turned a slightly darker pink. I’d like to play around with this idea more on other projects. 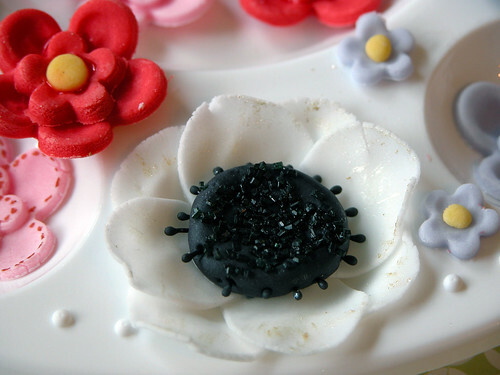 One of the things I really wanted to try from Peggy Porschen’s Cake Chic was her anemone flower – if you have the book, you might have seen it on the back on the cover. Everything I needed except the veining tool turned up from Jane Asher, but the anemone cutters were much smaller than I had thought they’d be. But as you can see, the flower still turned out pretty well! I decided to use ivory lustre powder instead of a pink blossom tint on this, and I think it came out quite well! The only thing is, the petals were very delicate and the whole thing got stuck in my palette when I tried to remove it. Totally tragic! But, I like the effect so much I might try doing the same thing with red petals to make poppies. The only things you can’t eat about this flower are the stamens, which are made of wire. Here are the flowers sitting in the palette, drying off and getting a bit of shape to them. This is just a cheap plastic artist’s palette from eBay, which only cost a couple of pounds including postage, bonus! 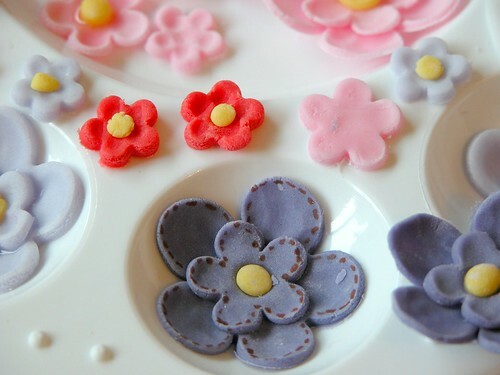 The perfect shape for little flowers. Don’t they look sweet? 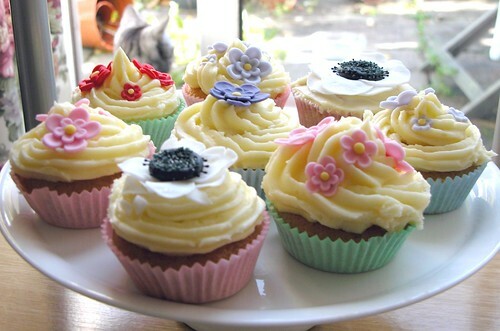 I’d leave them here if I didn’t have a load of cakes to decorate! And here they are! 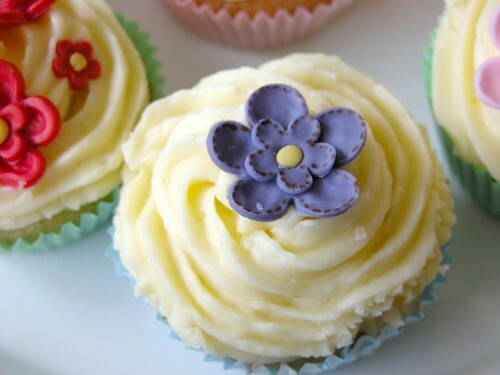 Peggy Porschen’s cupcake and buttercream recipes. Her cake recipe calls for four eggs for 24 cupcakes, which seems like a lot, but works perfectly. Once you’ve baked them, she asks you to soak them in sugar syrup as well, which seems excessive, but does make a nice moist cake. 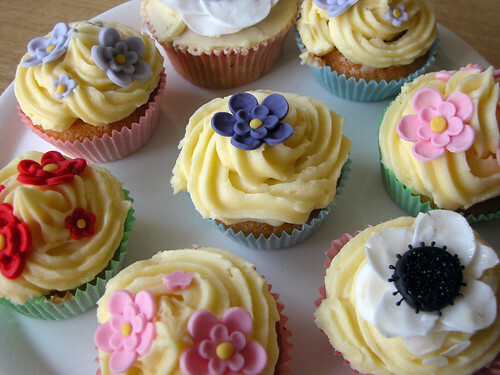 The buttercream is nice, but I think I’m a bit over how sugary it is. It’s a bit toooo sweet. 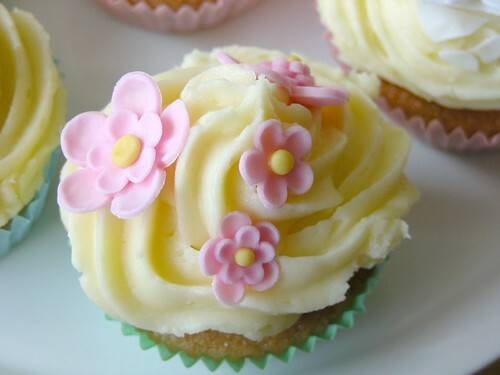 Here’s one of my patchwork flowers on the top of a cupcake. 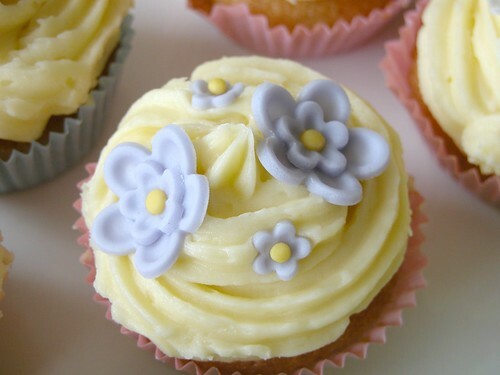 It’s so easy to decorate cupcakes with these – the plungers are really easy to use, and although I curved the petals with a boning tool and set them in a palette, you could skip these steps and they’d still sound great (get me, I sound like I know what I’m talking about!). I’m still not confident about piping on the buttercream – it never looks as good as other people’s, but luckily I think I’ll have plenty of opportunities to practice! Here they all are – pretty as a picture! But, please don’t look at my poor little anemone… It broke when I tried to take it out of the palette, and also when I tried to put it on the cupcake. Darn it! 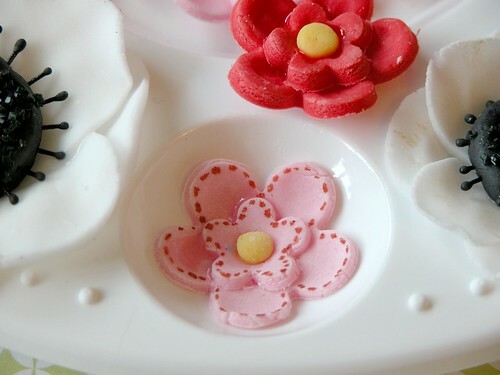 Well, I had a lovely birthday thanks to my family and friends, and a great time trying out sugarcraft properly for the first time… I just wish I knew what to do with rose petal cutters!